This space is used for a gathering area for the kids (or a fort/playhouse). 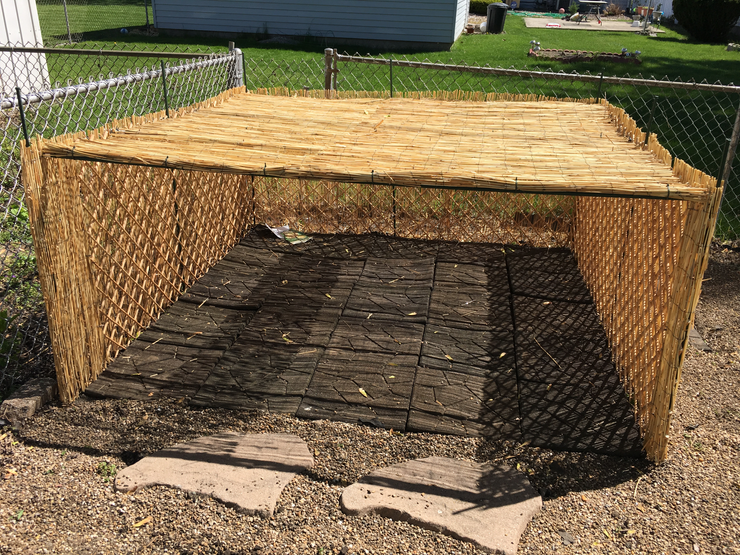 I went to Menards to look for ways to create a natural play house (since I gave away my two plastic little tykes houses). I originally planned to do an arch hut that I saw on Pinterest using a garden arch but when I saw the prices, I just kept walking. 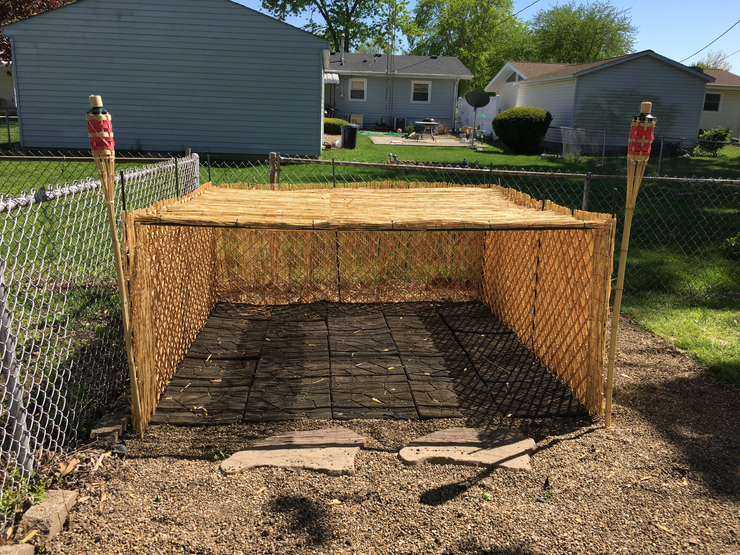 I then came up with the idea of using garden trellis, stakes and bamboo fencing. 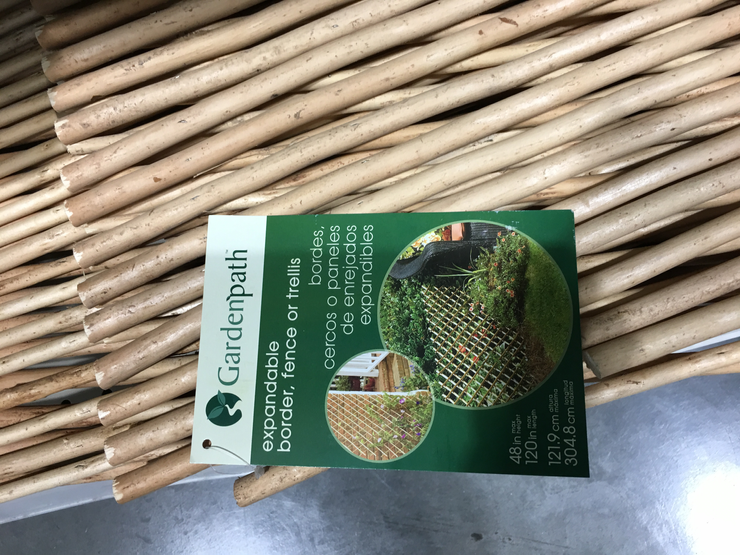 The garden trellis was an accordion type (pictured below), so it can expand to whatever size you want. 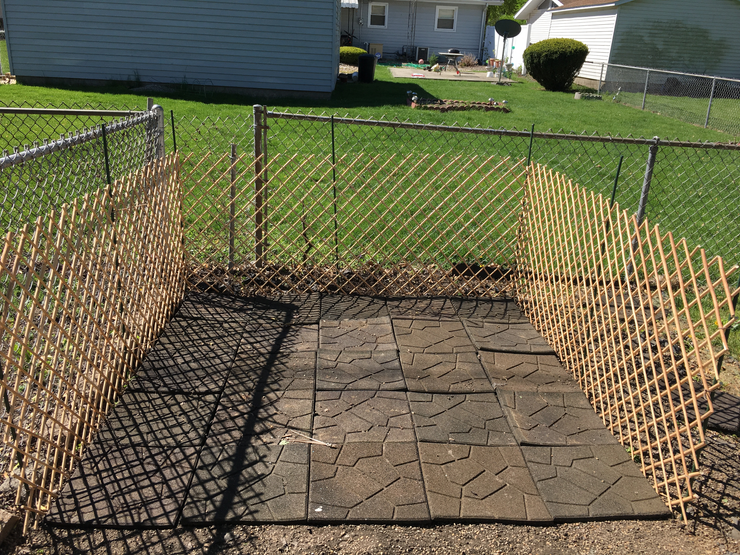 I already had the rubber pavers, so decided to make it around those and that’s how I determined my size. Step 1: Hammer the stakes into the ground. 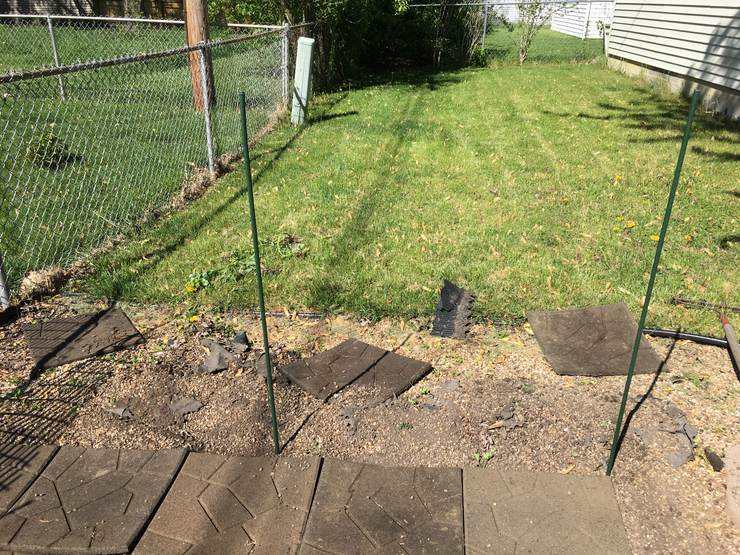 (I purchased 4 foot stakes with the rubber coating so they wouldn’t rust). If your sides are long, you would need a stake for each corner and then a stake for each wall for support. 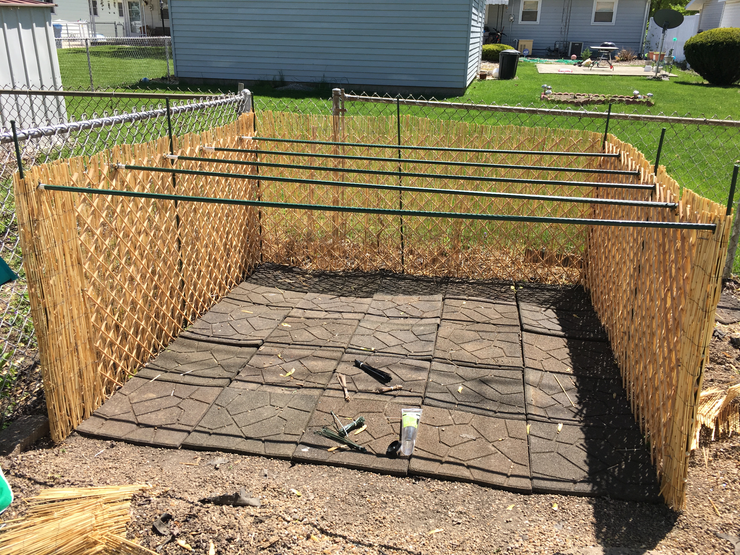 Step 3: Zip tie bamboo fence on three sides of the structure. Step 4: Trim off excess bamboo to the height you want the structure to be. Step 5: Place garden stakes on top to support the bamboo roof. Make sure to measure the width of your structure to know what size stakes to get. I rested them on top of the accordion fence and zip tied them in place. 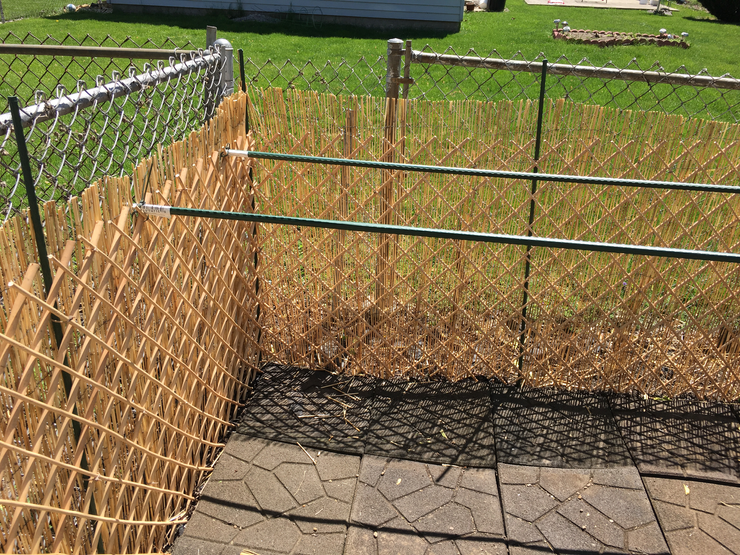 Step 6: Lay the bamboo fence on top and zip tie it down. Tip: Measure your space first so you have an idea of how many materials you will need. Tip: You will need a lot of zip ties to make it sturdy. I purchased natural colored zip tie. Tip: I did purchase an outdoor rug to place on top of the rubber pavers. This gave them a little bit cozier area and makes it easier to sweep rocks off of. This blog was written by family child care professional Sandra Cole, owner of Mrs. Sandy’s Family Child Care in Springfield, IL. This blog was originally posted on Sandy’s website, natureinspired, and is re-posted here with her permission.